British Gold and Silver Hallmark Guide for iphone and mobile. The price of gold and silver is at a very high level at the moment, so is popular with both buyers and sellers. However even experienced sellers make mistakes when dealing with precious metals and either sell too cheaply or pay too much simply by not checking the metals dates and purity. The value and purity of genuine gold silver and platinum is stamped on each item with hallmarks but with so many symbols they are hard to learn and commit to memory. 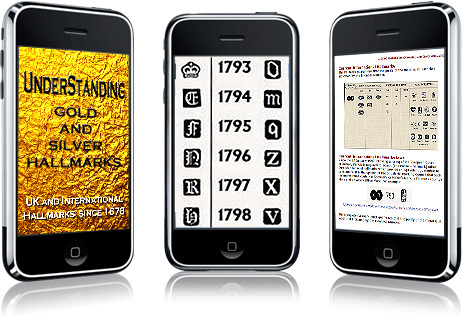 Introducing Understanding Gold and Silver hallmarks for the iphone and e readers. This simple to understand guide gives all the major UK hallmarks from 1678 to the present day and be used directly from your i phone or mobile device wherever you are. It gives quick access to all the major UK hallmarks and be easily scaled for the easiest viewing. Included is important information about the metals purity, history, rarity, origin and more. Understanding Gold and Silver hallmarks for iphone and e readers will allow the owner to quickly evaluate the gold, silver or platinum within seconds and give the user an advantage in most market situations for knowledge and profit. Works with free software including Acrobat, I reader, Amazon Kindle, Stanza etc on your iphone, ipod touch, Amazon Kindle, laptop, computer, and almost all mobile devices. Included is a 3 monthly report on the current situation on the gold, silver and platinum market. Hallmarks are the key to valuing silver and gold and if you have ever struggled to identify a hallmark – and let’s face it even experts cannot remember all of them, then you need portable expert information at your fingertips. No need to learn or memorise the hallmarks, just keep the guide handy and check the details before you buy or sell. Quickly decide whether the your object is pre 1975 and its original Assay office. How to quickly identify gold and Silver hallmarks that you see in car boot sales and markets. How to identify the international hallmarks on gold, silver and platinum products. Hallmarks used for events, dates or hallmarks that are no longer made. The 8 hallmarks that guarantee the quality and value on UK Assayed products. Buy this hallmark guide for your iphone, ipod touch or mobile device for £2.99 now.